For combustion to occur three ingredients are required. These are fuel, air, and heat (or an ignition source). Additionally all three must be properly mixed for combustion to continue. Before the liquid fuel can be burned it must be vaporized. The tube used to heat the fuel from a liquid state to a gaseous state is called the vaporizer coil. It is located an inch or so above the burner grate so that it can be heated by the flame of the burner. A short length of the vaporizer tube is also routed above the pilot so that it may be kept hot by the pilot when the burner is not firing. The vaporizer coil provides proper vaporization of the liquid fuel prior to burning. Exiting the vaporizer coil the vaporized fuel passes to the burner nozzles and mixing tubes (the car's original Cruban burner is shown at left) where the fuel is mixed with air in the proper ratio. The air-fuel mixture is drawn up through the metal grate of the burner where it burns on top of the grate. The action of burning the fuel effectively causes additional air-fuel to be drawn in through the mixing tubes so that he process can continue. The pilot provides the source of continuous ignition. 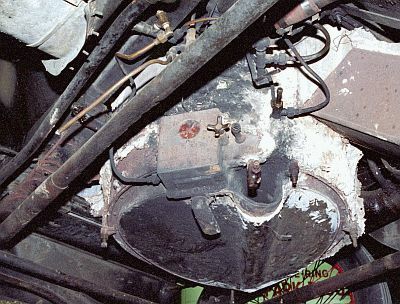 The superheater is another of the simpler devices in a steam car. It amounts to an eight to ten foot length of heavy-walled pipe that is mounted beneath the boiler and above the main burner fire. Its purpose is to add additional heat to the steam thereby allowing more work to be performed by the steam. There are several makes of after-market burners used on Stanley steam cars. While cars were shipped from the factory with a Stanley burner installed, many owners over the years changed to an aftermarket burner. Such names as Cruban, Baker, and Ottaway are some of the more common ones in use. This Stanley had a Cruban burner and pilot installed. 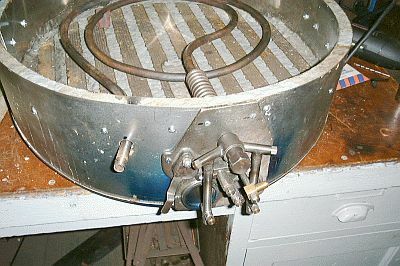 Stanley grates (a new Stanley burner being constructed is shown below) are cast iron but are lightweight while still sturdily built. Grates were either slotted or drilled and the burners were always the same diameter as the boiler. Stanley burner grates have peaks milled flat for about 1" of width. Between each of these flat peaks were valleys about 1" wide and 1" deep. These valleys were leveled to the height of the peaks with insulation to keep the heat off of the grate. The slotted grate had short slots milled across the top of each ridge. The drilled burner grate has thousands of holes drilled through the ridge to allow the air/fuel mixture to pass. The slotted grate was used up to about 1914. After1914 the drilled grate was used with either of their two fuel systems. Cruban offered a burner and pilot light combination of their own design. Their burners were much heavier than a Stanley being all cast construction. Cruban also built Stanley burner bottoms using their Nichrome heat resisting lining. A Cruban grate is similar in design to the Stanley slotted design. Cruban’s aftermarket pilot for use with a Stanley burner looked different in that they had a vertical air intake. All the photos in this gallery are in black and white. In 1998 when the boiler was being built digital camera technology was still new and quite expensive. The construction of the boiler was documented using black and white film. However in the year that it took to build the new boiler, prices had dropped and photo quality improved. In recent years digital scanning of film has become economical. The photos in the boiler restoration gallery were digitally scanned using a Minolta Dimage film scanner. For additional technical information on the burner, pilot, and/or superheater follow these links to the discussions in the technical reference of this web site. Click on the following link to view a series of advertising cards describing the design features of the Cruban burner.